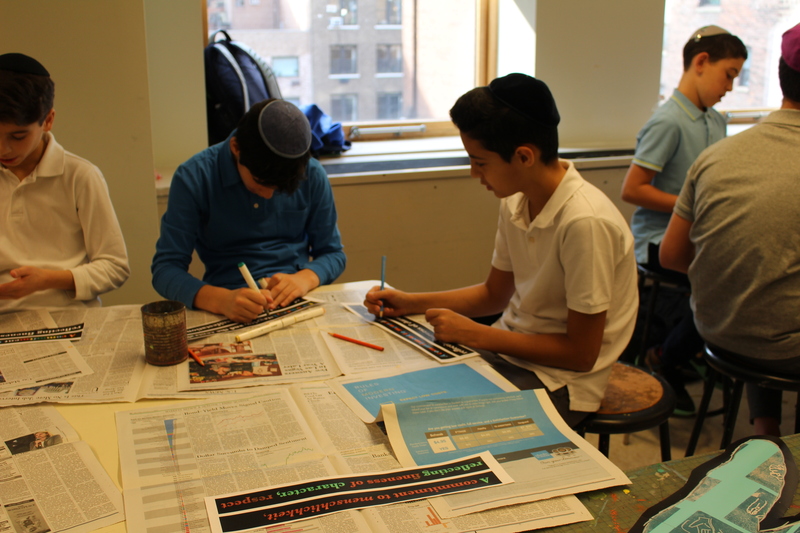 Seventh Graders Work With Jewish Museum Professionals On Chagall-Esque Mural With Focus on Menschlichkeit! Seventh graders put their finishing touches on a collaborative and meaningful mural they've been working on! With professional guidance from the Jewish Museum, students first learned about Russian avant-garde artists, Chagall, Lissitzky, and Malevich. Seventh graders were interested in learning about the artists' works, which were displayed publicly to celebrate the revolution in the town of Vitebsk, and the rise of the Soviet Union in general. Artists would showcase modernist murals on trains and on the sides of buildings to voice their important message of the rise of artistic freedoms (or so they thought). To connect with these revolutionary works, students decided to depict an important value from our own school mission statement -- the value of Menschlichkeit, to be represented in a collaborative and celebratory mural. Seventh graders began by making prints of pictures representing acts of kindness - these were then combined into one large mural that will soon be hung in the lobby of the Middle School! Stay tuned!